It’s not just the content of a lease that’s important for a successful tenancy. The way a landlord handles the leasing process also impacts rental income. 1. Timing matters when it comes to signing a lease. Don’t bring the tenancy agreement with you for a property tour. That way, you will never make the mistake of presenting the lease to a tenant before conducting a tenant background check. Problem tenants often attempt to rush the process by offering to rent on the spot. That may be a ploy to avoid tenant screening which could reveal a bad rental history. 2. The lease document itself should be reviewed by a lawyer (or paralegal where allowed) prior to being placed into service. After that, stick with the plan. Don’t change the terms or allow the tenant to modify the lease without having those changes reviewed. If the tenant doesn’t like some provision in the lease, that may be a disqualifying factor. While the lease agreement must be customized with the individual tenants’ name and the particular terms for the tenancy, never modify the provisions of the agreement for an individual tenant at the last minute, or without seeking legal advice. 3. The tenancy agreement may contain many pages, including attachments. Number the pages, preferably using the style Page __ of _____. Also, check that any attachments to the lease are mentioned in the body so that there is no confusion regarding what is included, and there is no risk that important provisions were inadvertently left out. The tenant can’t comply with rules that they haven’t seen. 4. Don’t accept signatures online — unless you’ve already discussed the particulars of the tenancy agreement with the tenant. 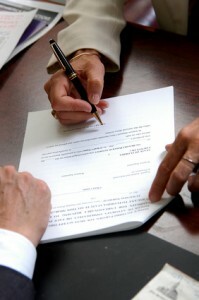 This is not so much a problem with verifying the tenant’s signature as it is not knowing if the tenant read the lease. A tenant is more likely to meet the terms of the tenancy agreement if he or she has read the provisions and understands what is expected. 5. Once the lease is signed, continue to resist change. The lease should contain a provision that prohibits subsequent modifications unless the change is agreed to by both tenant and landlord and reduced to writing. This not only prevents misunderstandings, but is useful when attempting to enforce the lease. 6. Before filing the lease away, note the important dates on a calendar. That may include the timing of routine property inspections. To require these inspections in the lease, and then ignore those requirements trains tenants to believe the landlord is absentee. Likewise, the renewal date should be noted on a calendar, and renewal discussions should occur about 60 days prior to the expiration of the lease. Landlord Tip: A tenancy agreement should be comprehensive enough to govern a long-term tenancy, as many tenants choose to remain beyond the standard one-year term. Please post these to B.C. Property Manager Discussion Group in LinkedIn. Marv has been made one of the contributors to the group.